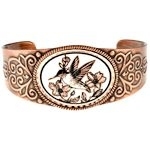 This unique handmade cuff bracelet, individually artisan handcrafted, has a hummingbird and flowers on an embossed copper bracelet. The diamond cut really makes it sparkle! This totemic hummingbird bracelet is one inch wide at the widest point and measures 2 3/8" from side to side. 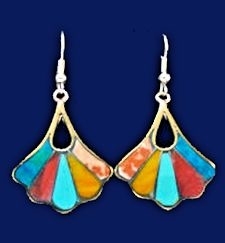 It is adjustable to fit most wrists. This product was added to our catalog on 01/08/2018.